The overall temperature of the earth is increasing faster now than it has for many millennia. According to a 2007 Intergovernmental Panel on Climate Change (IPCC) paper, the global surface temperature is expected to increase by 1.1 to 6.4 degrees C (2.0 to 11.5 degrees F) during the 21st century. According to the models, global warming will be most pronounced in the Arctic resulting in the melting of glaciers, permafrost and sea ice. Warming is expected to be less pronounced in Antarctic areas. 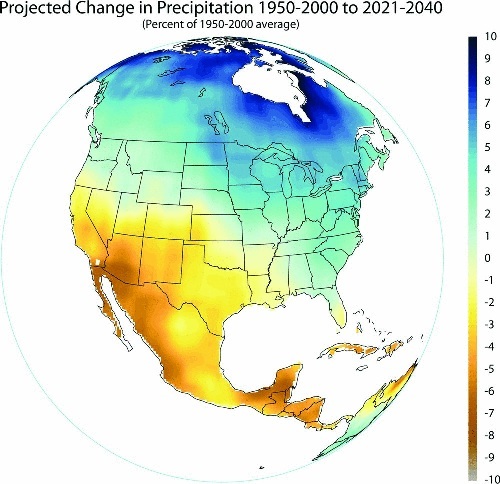 Precipitation change in Mexico, from 1950-2000 to 2021-2040. Image/data: Gabriel Vecchi, Geophysical Fluid Dynamics Laboratory, National Oceanic and Atmospheric Administration. Given the high average altitude of Mexico, the temperature changes and raising sea level should have less impact on Mexico than most other countries. Still, low laying areas of Mexico will be affected significantly. Global warming will have profound impacts on the world’s climate. The most severe impacts on Mexico, and perhaps the whole Earth, could very well result more from climate change than global warming per se. In general, the affects will involve significant changes in average annual amounts of precipitation as well as huge year to year variability. Mexico will experience significantly more severe droughts, floods, and storms including hurricanes. This trend has already started. In the 25 years between 1960 and 1985, Mexico experienced one category five hurricane – Beulah in 1967. In the 25 years since 1985, four category five hurricanes hit Mexico: Gilbert – 1988, Mitch – 1998, Wilma – 2005, and Dean – 2007. Fortunately, no category five hurricanes struck Mexico in 2009 or 2010. Are we due in 2011? In general, precipitation in Mexico is expected to decline significantly in the next several decades. As you can see on the map, Western Mexico and the Yucatan will get 5% to 8% less rain. This is particularly important to Northwestern Mexico which is the most arid part of the country. Unfortunately, with the expected large increase in year to year variability, this part of Mexico is expected to suffer many very serious droughts. Obviously, less rainfall and greater variability will have gigantic impacts on Mexican agriculture, especially in the drier western areas.